When I left Orlando after the state finals, my intent was to decompress and focus on the holiday season. However after dialoguing with several coaches in my area regarding the 18th Annual Nike All-Star Game between Dade vs. Florida, I wanted to give my brief take on these events in general. To me these events offer grade benefits if the following happens. 1) Players are selected in an equitable manner with equal opportunities to participate once chosen. 2) Players are exposed to different players in practice and in the game. 3) Players learn different approaches to the game. 4) Players and coaches receive added exposure which could help them advance whether it be a scholarship for a player or a better position for a coach. 5) No player gets unnecessarily injured. 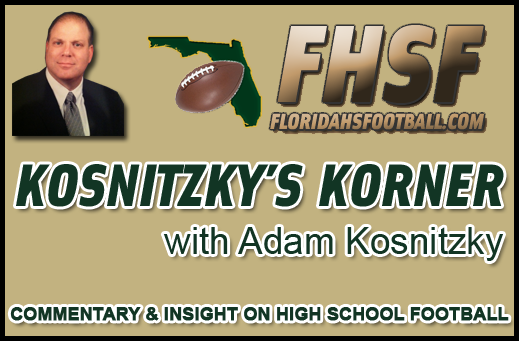 Adam Kosnitzky is a columnist for FloridaHSFootball.com. You can follow Adam on Twitter at @akosnitzky.